In Search of Gordon Dioxide. Do you know him? The other night Jack asked me to read him a bedtime story. And all the books were like ten miles across the room. And I was trapped under the covers by a dog lying on top of me. It’s a collection of the funniest, quirkiest, silliest, most randomly clever stories I’ve ever read. They make me laugh out loud. Honest. And they’re written by a guy named Gordon Dioxide. (Something tells me that’s not his real name. Maybe he’s in the Witness Protection Program or something.) He reminds me of Ogden Nash. Kevin the Very Old Rabbit was very old. Believe it or not, he was 146 years old and his name was Kevin. He had always been old. In fact, when he was born he had glasses and a long white beard, which greatly surprised his mother because she had perfect eyesight and no facial hair whatsoever. His dad was called Kevin the Extremely Old Rabbit, but he’s not in this story. Now, every Tuesday morning Kevin would drive to the post office in Swindon to collect his pension money. But today was no ordinary Tuesday morning for two main reasons. Firstly it was his birthday and secondly it was in fact Wednesday. This meant that he was actually 147 years old. The only problem was, he didn’t know it! You see, because he thought it was Tuesday he thought that his birthday was not until tomorrow! Anyway, he parked the car in the usual place – on double yellow lines opposite the police station. He turned on the radio and got out of the car. He never had the radio on when he was driving because he hated pop music. Visit his website to read the rest of this story. The ending will shock you. Having fallen in love with his work, I wanted to read more by Gordon Dioxide or at least learn about this writer with the chemistry suffix last name. My searches have turned up absolutely nothing. No Wikipedia page. No photos. No about the author page. The closest I’ve found is a Youtube video and a book he published. I assume it’s Gordon reading the story. Sort of sounds like Mr. Bean, doesn’t he. So I’m reaching out to the public. If you know Gordon Dioxide or he’s your cousin or something, I’d love to meet the guy. He’s brilliant…in a preschooler mentality sort of way. If you happen to read this post, thanks for the bedtime stories. You’ve got big fans in Richmond, VA. 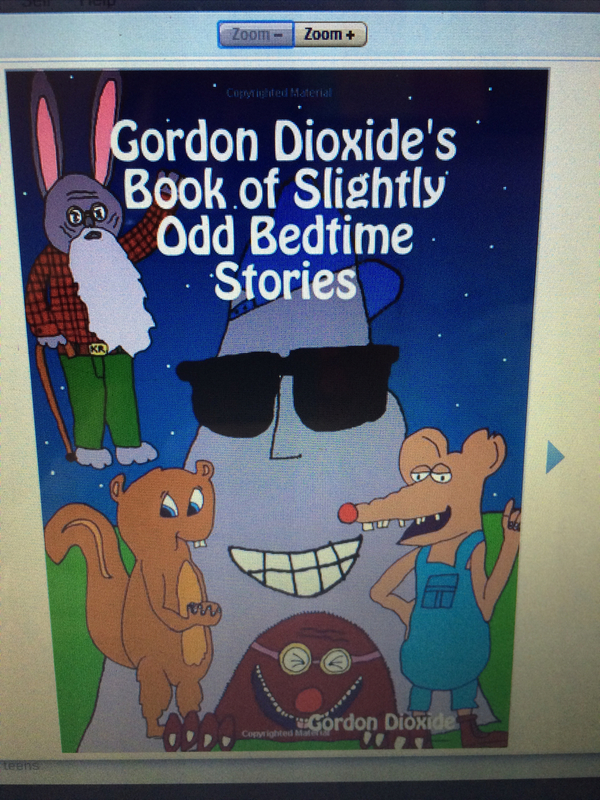 This entry was posted in Uncategorized and tagged bedtime stories, Gordon Dioxide, Kevin the very old rabbit. Bookmark the permalink. 12 Responses to In Search of Gordon Dioxide. Do you know him? I will check this out for sure! Oh btw – video not loading 🙂 have a great weekend! Ok so I’m looking up the ending now!! Thanks for the suggestion. We always read at bedtime. Good to know. Thanks, my friend. You do the same. I’ll check on that video right now. You’ll love GO2. He’s so funny and random. Aww this is so interesting. I MUST know the ending after that tease! Where in the world is Gordon Dioxide?? Excited for the ending of THIS story too; perhaps you’ll hear from him! Yeah, that’d be so cool, Amanda! I love this! It is great to find fun authors. I have to find more for my struggling readers in 4th grade (sp.ed. teacher). They would love it. I’m so glad, Megan! I hope your students enjoy the stories. They’re so much fun to read. I love Gordon Dioxide! I discovered him about four years ago when I asked my husband to read me a story because I could not sleep. This is what he found on google search and we both thought the stories were hilarious. I am actually in the middle of writing a blog post about him now. Kinda hard when there isn’t much out there. I enjoyed your post! Thanks, Whitney! Isn’t it funny that there’s nothing else out there about him! Who is this elusive, funny Gordon Dioxide? I’ll be looking for your post.